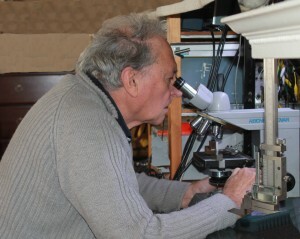 Below is a guest post written by Terry Summers from Summertone Ltd. We first encountered Terry because of his expertise refurbishing analogue magnetic tape heads. As one of the few, if not only, specialist UK-based company working in this area, we wanted to know more about Terry’s work. We were keen to understand the secrets of magnetic tape refurbishment, and whether Terry accepted that obsolescence for analogue media was imminent, as many audiovisual archivists claim. Many thanks Terry for taking the time to write the article, we hope you enjoy it. Before I opened Summertone Ltd. I was for very many years, the Managing Director and magnetic head designer for the head manufacturing company Branch & Appleby. This was a specialist company serving the audio recording industry with magnetic heads as a supplier to Original Equipment Manufacturers in the analogue tape and film industry and for replacement heads for other types. B & A was particularly strong in the magnetic head supply for recording on perforated film for the synchronisation and editing of film sound, being the supplier of heads to many OEM studio film equipment manufacturers. The range of analogue heads designed and made by B & A was legion, ranging from 32 track 2 inch to 8mm film heads. B & A also supplied heads for other purposes, magnetic card readers and bank note verifiers being examples. To be able to refurbish a magnetic head, it is essential to understand the working, the manufacturing principals and the materials used in it’s manufacture. That expertise is with Summertone and is the reason for it’s success. The various magnetic materials used (mumetals of various grades, vitrovacs, ferrites etc.) each require specialist equipment and methods of surface finish to obtain intimate contact with the recording medium. A fact that is frequently overlooked is that a refurbished magnetic head has a performance that is superior to when it was new! The reason is that the magnetic losses due to the gap depth are less. So refurbishment not only restores the head’s ability to contact the magnetic material correctly, having removed the uneven wear caused by the abrasive recording medium, but also gives the head an improved performance, essential for the reproduction of archive, sometimes damaged material. The audio industry has of course changed with the coming of the digital age, some say for the better, but others disagree. We refurbish analogue heads for studios and individuals that are dedicated to the recording and reproduction of sound with the full complement of all the harmonics that are lost with a digital frequency cut off. We cannot hear them, but they colour the overall sound picture that we hear. That is the reason for the continuation of the use and restoration of the abundance of analogue machines by our studio customers (and some private users also). The magnetic head is the vital link with the medium and is essential that it is kept in tip-top condition. There are also many archival organisations that require the services of head specialists. The British Film Institute for instance, prides itself with the fact that the preserved sound it achieves is in many cases superior to the original public performances. This is due to their keeping their magnetic/optical sound pickups in excellent order and then, after transfer, using modern digital techniques to manipulate and store the results. Summertone receives heads from all over the world for refurbishment and is proud and pleased to say that the percentage of heads that it receives for refurbishment that are not able to receive suitable treatment, is very small indeed. 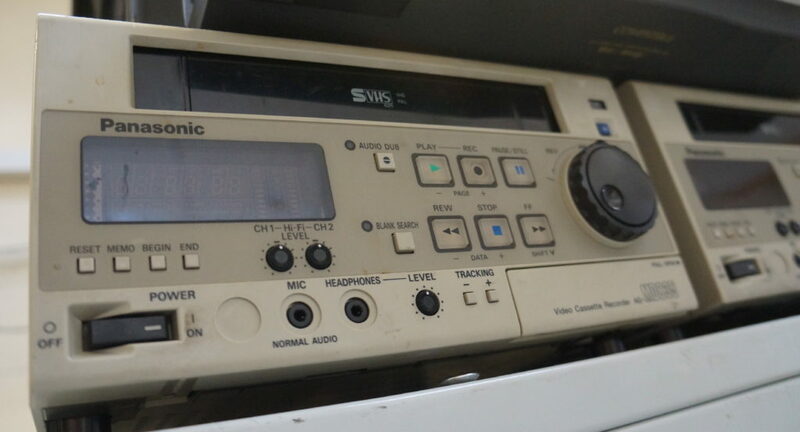 The scarcity of machines can be a problem, but as the number of studios using analogue machines diminishes they tend to pass to dedicated companies and individuals who appreciate their importance and who go to great lengths to ensure they are kept in a working condition or used for spares, not thrown in the skip. We appreciate that this cannot go on for ever, but the indications at the present time are that there are many who have the expertise to help in the specialist areas needed to keep archive machines in good working order. It is a fact that the older analogue machines seem to be so well designed and built that they have very few faults that cannot be rectified easily. For instance, last week we switched on a 1960s valve recorder that had not been run for very many years. It performed perfectly. Another just needed a simple capacitor replacement for it to also perform. The point we are making is that the older technology was, and still is, reliable and understandable, unlike many modern machines. It is possible to build new tape head blocks from scratch, but that is really not economical due to cost. We can, and do, still have replacement heads made to my designs but only if it is justified to keep a valuable, scarce, rare format, machines functioning. There are heads around, both new and second hand that can be refurbished. These can be obtained by combining two machines both for mechanical parts and heads. Summertone also has a small stock of heads. I do not agree with the archivists who say that there is a 10-15 year span left to transfer material. Magnetic tape and film has stood the test of longevity without deterioration which is why it is still being used for digital archiving. More modern archive methods have been failing. With good maintenance, analogue machines have a good life left and spares are still able to be obtained and manufactured as they are understandable to good engineers. I am sorry to say that when Summertone closes, our expertise for magnetic heads will be lost as it has not been possible to transfer a lifetime of analogue experience to another, due partly to the lack of financial incentive. This article is a bit late to break this news, but it is worth highlighting again in case you missed it first time round. In May 2015 the British Library were awarded over £9.5 million pounds by the Heritage Lottery Fund to help them deliver their hugely important Save Our Sounds project. We told you about Save Our Sounds earlier in the year. Also worth a read is the recently published Living Knowledge: The British Library 2015-2023, which sets out the strategic priorities of the organisation in its 50th anniversary year. 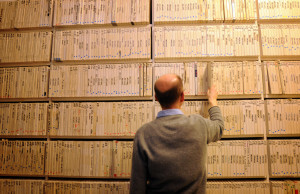 Within the strategy digitising ‘the 42 different physical formats which hold our 6.5 million audio items’ is highlighted as ‘the next great preservation challenge’ for the British Library. As ever, we will keep you up to date with updates from the British Library’s Save Our Sounds project as it evolves. Today, October 27, has been declared World Day for Audiovisual Heritage by UNESCO. We also blogged about it last year. 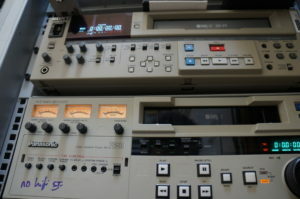 Since 2005, UNESCO have used the landmark to highlight the importance of audiovisual archives to ‘our common heritage’ which contain ‘the primary records of the 20th and 21st centuries.’ Increasingly, however, the day is used to highlight how audio and moving image archives are particularly threatened with by ‘neglect, natural decay to technological obsolescence, as well as deliberate destruction’. As it is World Audiovisual Heritage Day, we thought it would be a good idea to take a look at some of the recent research and policy that has been collected and published relating to digitisation and digital preservation. While the UNESCO anniversary is useful for raising awareness of the fragility of audiovisual mediums, what is the situation for organisations and institutions grappling with these challenges in practice? The first to consider are preliminary results from a survey published by the US-based NDSA Standards and Practices Working Group, full details can be accessed here. 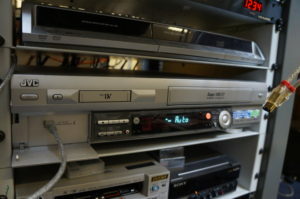 It may well be that there is simply more video on analogue/ physical media than other mediums which can account for the higher response, and that archives are yet to grapple with the archival problem of digital video stored on physical mediums such as DVD and in particular, consumer grade DVD-Rs. Full details will be published on The Signal, the Library of Congress’ Digital Preservation blog, in due course. Another piece of preliminary research published recently was the user consultation for the 2nd edition of the Digital Preservation Coalition’s Digital Preservation Handbook. The first edition of the Handbook was published in 2000 but was regularly updated throughout the 00s. The consultation precedes what will be a fairly substantial overhaul of the resource. Many respondents to the consultation welcomed that a new edition would be published, stating that much content is now ‘somewhat outdated’ given the rapid change that characterises digital preservation as a technological and professional field. Survey respondents ranked storage and preservation (1), standards and best practices (2) and metadata and documentation (3) as the biggest challenges involved in digital preservation, and therefore converge with the NDSA findings. It must be stressed, however, that there wasn’t a massive difference across all the categories that included issues such as compression and encryption, access and creating digital materials. It will be fascinating to see how the consultation are further contextualised and placed next to examples of best practice, case studies and innovative technological approaches within the fully revised 2nd edition of the Handbook. Our final example relates to the European Parliament and Council Recommendation on Film Heritage. The Recommendation was first decreed in 2005. It invited Member States to offer progress reports every two years about the protection of and access to European film heritage. The 4th implementation report was published on 2 October 2014 and can be read in full here. Although the recommendation relates to preservation of cinematic works specifically, the implementation report offers wide ranging insight into the uneven ways ‘the digital revolution’ has affected different countries, at the level of film production/ consumption, archiving and preservation. The report gravely states that ‘European film heritage risks missing the digital train,‘ a phrase that welcomes a bit more explanation. One way to understand is that it describes how countries, but also Europe as a geo-political space, is currently failing to capitalise on what digital technologies can offer culturally, but also economically. The report reveals that the theoretical promise of interoperable digital technologies-smooth trading, transmission and distribution across economic, technical and cultural borders-was hindered in practice due to costly and complex copyright laws that make the cross border availability of film heritage, re-use (or ‘mash-up’) and online access difficult to implement. This means that EU member states are not able to monetise their assets or share their cultural worth. Furthermore, this is further emphasised by the fact that ‘85% of Europe’s film heritage is estimated to be out-of-commerce, and therefore, invisible for the European citizen’ (37). In an age of biting austerity, the report makes very clear that there simply aren’t enough funds to implement robust digitization and digital preservation plans: ‘Financial and human resources devoted to film heritage have generally remained at the same level or have been reduced. The economic situation has indeed pushed Member States to change their priorities’ (38). There is also the issue of preserving analogue expertise: ‘many private analogue laboratories have closed down following the definitive switch of the industry to digital. This raises the question on how to maintain technology and know-how related to analogue film’ (13). 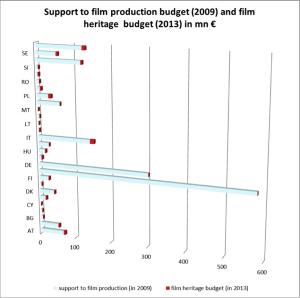 The report gestures toward what is likely to be a splitting archival-headache-to-come for custodians of born digital films: ‘resources devoted to film heritage […] continue to represent a very small fraction of resources allocated to funding of new film productions by all Member States’ (38). Or, to put it in numerical terms, for every €97 invested by the public sector in the creation of new films, only €3 go to the preservation and digitisation of these films. Some countries, namely Greece and Ireland, are yet to make plans to collect contemporary digital cinema (see opposite infographic). It is extremely useful to have access to the research featured in this article. Consulting these different resources helps us to understand the nuts and bolts of technical practices, but also how different parts of the world are unevenly responding to digitisation. If the clock is ticking to preserve audiovisual heritage in the abrupt manner presented in the Swiss National Archives Film, the EU research in particular indicates that it may well be too late already to preserve a significant proportion of audiovisual archives that we can currently listen to and watch. As we have explored at other places in this blog, wanting to preserve everything is in many ways unrealistic; making clinical selection decisions is a necessary part of the archival process. The situation facing analogue audiovisual heritage is however both novel and unprecedented in archival history: the threat of catastrophic drop out in ten-fifteen years time looms large and ominous. All that is left to say is: enjoy the Day for World Audiovisual Heritage! Treasure whatever endangered media species flash past your eyes and ears. Be sure to consider any practical steps you can take to ensure the films and audio recordings that are important to you remain operable for many years to come. You are currently browsing the greatbear analogue and digital media blog archives for October, 2014.